On this, the 49th day of your passing. I’ve had a few people ask me, “How do Buddhists grieve?” Of course, the answer is simple. Like everyone else. For me, when it started it was like standing on at the edge of an ocean, the waters gently brushing against my feet. People would warn that a giant wave was coming but I convinced myself that I could handle any storm—stand firm against any tide. Then the water was gone and only sand and shells were beneath me. The waves had retreated to gather into the tidal wave that swept over and lifted me up faster than I could have ever imagined. When the water recedes, you find yourself left intact but in a different world. That previous place of perspective is gone forever. And then the sun begins to warm you and the grass grows beneath your feet once more. 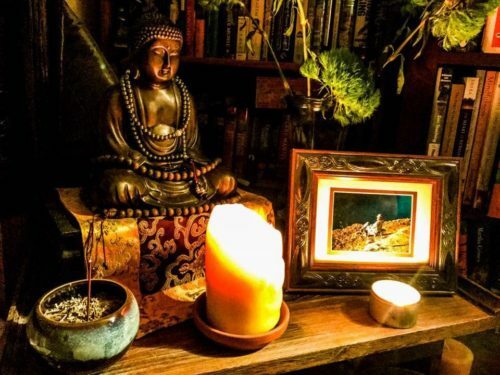 I was told to chant the Daihishin Dharani for the first seven days of my father’s passing and then every seventh day all the way up to the 49th, to dedicate the service to him and place his photo on my altar. So, that’s what I have been doing. At first it felt strange and formal. Then it quickly became comforting. And then it was over. On the last day of the service I took some time to remember and reflect. I looked at some old photographs of us together and conjured the sound of his voice. I removed the photo from the altar, cleared away the flowers that needed to be replaced, trimmed the candle, and tidied the incense bowl. I went for a walk later that day and noticed goldenrod flowers beginning to turn the deeper amber of early autumn. Ironweed had begun to bronze a bit or withered away to only blackened stalks against the fading and wilting wild morning glories. The nights have now dipped down into the lower 40’s. That night I awoke suddenly around 3 a.m. I quietly moved through the house and, slipping on some sandals, walked out into the chilly moonlight. The moon was incredibly bright for three quarters full and I wandered up into the fields. In the meadows, deer walked quietly nearby and I found a soft patch of grass to sit in. I watched the stars overhead against the dark sky. In silence I find my strength, in nature I find perspective and humility, in death I find thankfulness that I was a part of my father’s life and he, mine.